Jungle Island is one of the best animal/nature themed attractions in the Miami Area. They have a wide range of animals from birds, to big cats, reptiles, and primates. There are lots of shows throughout the day during the park, so many shows in fact you may feel overwhelmed. There are lots of animal encounters, with add on photo opportunities (extra fee), and there are lots of educational moments about conservation and environmental concerns. A visit here can get pricey especially if you add in any in park photo moments, so be sure to look for coupons or use a Miami Go Card to save on the cost. All in all this is one of the top attractions in the area, with lots of up close and personal animal moments you don't normally get at a zoo visit, and is worth the trip. Jungle Island in Miami was the brain child of Franz Scherr. Scherr moved to America from Austria in 1911 and worked as a carpenter throughout the country. He always loved nature and when the opportunity to move to Homestead, Florida during the land boom of the 1920’s came along he and his family moved and began living off the land. Eventually Franz bought a feed and supply store and he began to collect a few birds in the store. He grew to love the friendly nature of the birds and an idea was born. Franz Scherr met with his friend, Joe DuMond, owner of Monkey Jungle, and was inspired to start his own jungle, Jungle Island. Initially he rented 20 acres of hammock and moved to the area to begin his passion. Franz was one of those dreamers who believed he could accomplish his goal and was only faced with opposition and doubt from most of his friends and family, but he persevered and began collecting birds. He built a nature trail through the coral rock and hammock, leaving the rest of the area in its natural habitat alone. 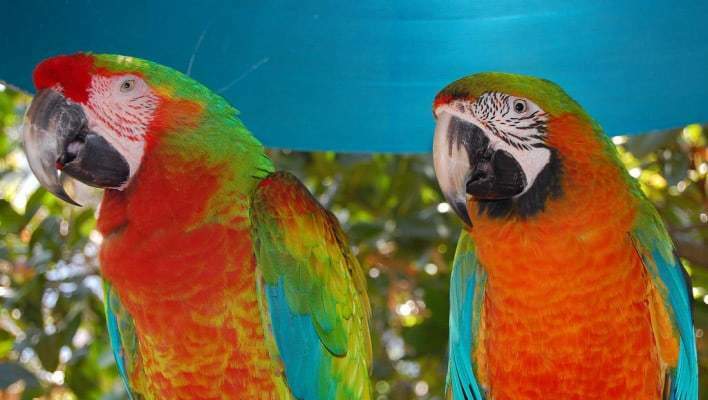 The first birds to inhabit the island were 25 Macaws who adapted well. Word got out and the visitors starting coming to see the birds, experience the natural habitat and listen to Franz Scherr give narratives about the habitat. Today the island is home to more than 1,100 tropical birds, 2,000 types of plants and flowers and one of the best trained bird shows around. The birds are obviously the biggest draw to Jungle Island but it’s not just parrots anymore. One of the most unexpected creatures that you’ll see at Jungle Island are the African Penguins. These cute little guys are not cold weather birds and are incredible swimmers and divers. In addition to the African Penguins you’ll also see Blue and Gold Macaws, Black Palm Cockatoos, Double-Wattled Cassowaries, Chinese Silky Chickens, Eclectus Parrots, Emus, Caribbean Flamingos, Hyacinth Macaws, Lories, Sarus Cranes, Scarlet Macaws, Yellow-Naped Amazons, King Vultures, Great Horned Owls, Andean Condors and more. There are food dispensers throughout the park and most of the birds enjoy being fed by visitors. Make sure to stop and take advantage of this opportunity. In keeping with Franz Scherr’s love of all nature the park doesn’t only feature birds, the native and imported plants are an important part of the experience in the park. One of the more interesting plants on the island is the Sausage Tree, its fruit looks a lot like really big sausages hanging down by strings. The fruit is woody and not good to eat but it can be used to ferment beer, cure snake bites and some skin problems. In addition to seeing the Sausage Tree you’ll get to see Bo Trees, Cycads, Coconut Palms, Red Bougainvillea, Calabash Trees, Bromeliads, Bananas, Crotons, Banyan Trees, Platycerium, and Crodia Lutea among many, many more. But Jungle Island is more than a walk in the wild, the park has grown and now serves a variety of different age groups, interests and activity levels. La Playa is a private beach at Jungle Island that is open to guests to the park. Relax on the beach or play in Biscayne Bay. Let your kids go wild on the water slides, bouncy house and swim area. Or enjoy a tropical drink and snack from the snack bar. One thing to remember is that La Playa requires footwear at all times, so if you don’t have aquatic shoes you’ll need to pick up a pair at the Island treasures and Gifts Shop. Believe it or not, that is not all the Jungle Island has to offer. In addition to the incredible birds, the beautiful flora and the private beach at La Playa there are a number of exhibits and events that are open to visitors and happen throughout the day. Tiger tales is a brief 10 minute instruction and discussion on the proper care and handling of the exotic tigers on the island, led by a trained professional who works with these magnificent creatures daily. The Primate Exhibit & Presentation is a humorous display put on by Jake and Hanna, local orangutans. There are also capuchin monkeys, saimang and gibbons who participate in the production. There is also a 10 minute presentation to give you more insight into these animal residents and their life on the island and a question and answer session for those who want to know more. The liger habitat is a must for any Napoleon Dynamite fans as these rare mixed breed lion and tigers wander the enclosure, all 900 pounds and 12 feet of him. One animal that hasn’t been mentioned but is definitely a resident of the Jungle Island is the famous Florida native, the alligator. A walk through the Everglades Habitat & Walk may give you a glimpse of this prehistoric critter but a visit at the Crocodile Care exhibit will definitely give you a closer view of these magnificent monsters in addition to some crocodiles and a rare albino alligator. An expert on the island will give you information about these animals and is there to answer your questions. And always keep your eyes open as you wander around the park as the trainers are positioned throughout the area with animals that are used to human contact so you can interact with them, ask questions and take pictures to remember your visit. You’ll really be surprised at how much there is to see and do at Jungle Parrot Island, its Franz Scherr’s dream and so much more.